You are browsing the archives of 2016 June. 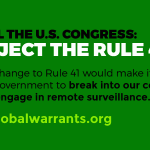 We stand in protest on June 21st 2016, against proposed changes to Rule 41. We are with EFF on this.